When a member of staff bought a Singer sewing machine from a Norwich charity shop, she discovered a love letter that has remained hidden for the best part of 50 years. While shopping in Norwich, I noticed a fantastic Singer sewing machine with a Lotus flower design, in the window of the Oxfam shop. I went in and bought it, but then there was the problem of getting it home. With my son’s help we managed to get it as far as Tombland before giving up and getting a taxi home. Hidden in the base we discovered a folded letter. 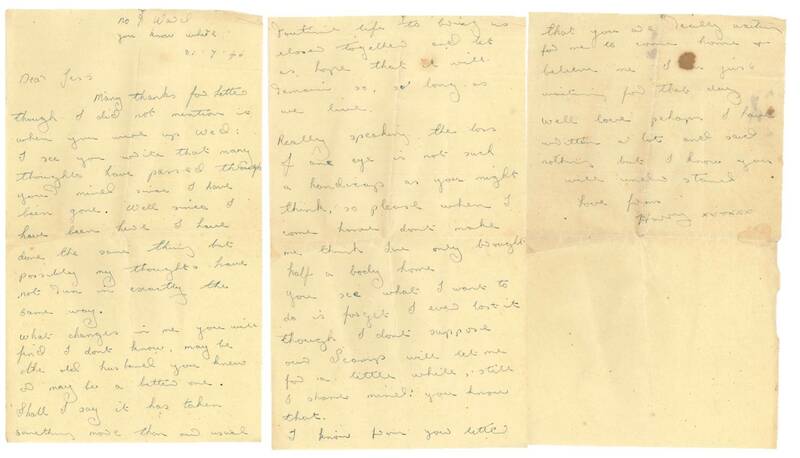 It seemed to be a love letter from an injured husband (Harry) to his wife (Jess) dated 31 July 1946. Unfortunately no surnames or location are mentioned. not run in exactly the same way. or maybe a better one. believe me I am just waiting for that day. nothing but I know you will understand. Here in the Norfolk Record Office this moving letter can be preserved and cared for, allowing future generations to look back in time and rediscover this period of our history. Everyone at the Norfolk Record Office would love to know more about the circumstances surrounding the letter and even the identity of the couple. Do you have any ideas? This entry was posted in Snapshots from the Archive and tagged letters, love, mystery, Second World War, valentines. Bookmark the permalink.